Joyoshare newly released its updated version for Joyoshare Screen Recorder with built-in editing tool supported to better polish and manage video and audio recordings. Hong Kong, Oct. 09, 2018 – Joyoshare Software recently announced a new upgrade for its Joyoshare Screen Recorder, with which users can get more chance to edit video & audio recordings and customize personalized watermark. Compared to the previous one, it also made improvements and optimization in other aspects. Adopted advanced screen capturing technology, the newest Joyoshare Screen Recorder does well in recording any videos and audios on Windows and Mac desktop screen, including Google Hangouts conversation, Facebook call, Netflix movie, Spotify music, YouTube audio, Twitch stream, Skype chat, webinar conference, etc. Meanwhile, users can record video with audio simultaneously and decide whether to grab system audio or microphone sound. After updating to recent version, all created recordings, no matter videos and audios, can be sliced in edit window with wanted segments left, during which users are allowed to take snapshots in JPG and PNG readily. 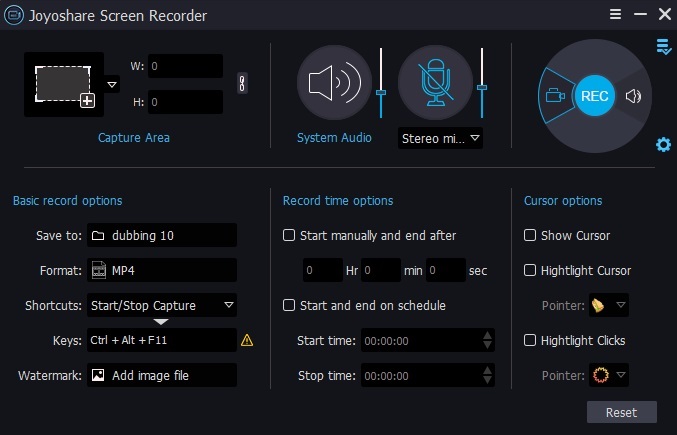 As a versatile screen recording program, the updated Joyoshare Screen Recorder is also developed with professional recording settings. It enables users to skip useless contents, cut recording files, take screenshots, create scheduled task, add click effect, select needed capturing area, add ID3 tag info, etc. as per actual requirements. In this update, more rights offered to add image watermark and trim unnecessary portions from video/audio recordings, facilitating users to sort out recording files to the maximum extent possible. The marketing director of Joyoshare, Dave, said, "Joyoshare is always committed to providing better service to users and on the way to issue new version all the time so that excellent features can be designed and delivered continuously. Sure, Joyoshare will try its best to satisfy the needs of users just as this time, adding marvelous video editing function and customized watermark option to the latest Joyoshare Screen Recorder." 3. Optimized UI and fixed some minor bugs. 6. Spotlight clicks and cursor movements, create image watermark, take snapshots and trim recordings easily. Joyoshare Screen Recorder is currently downloadable and applicable on both Windows and Mac operating systems, available for Windows 10/8/8/Vista/XP and Mac OS X 10.8/10.9/10.10/10.11/10.12/10.13. Now, this powerful screen recorder is reasonably priced at $29.95 for a single license and $59.95 for 2-5 PCs with lifetime free software update and tech support while the unlimited license is $79.95 for 5+ PCs. Joyoshare is a top-notching multimedia software developer and provider specialized in video field for years. With innovative technologies and professional R&D team, Joyoshare is dedicated in developing the best video and audio solutions, including video converter, audio converter, video editor, media cutter, HEIC converter, screen recorder, iPhone data recovery, media player, etc. to customers all around the world. With professional and high quality service, Joyoshare has won high reputation from millions of registered users from the past years.